Hospitals can reduce their energy consumption, minimize impact on the environment, and protect their bottom line by upgrading to high-efficiency equipment and systems. According to a U.S. Environmental Protection Agency (EPA) study, every dollar a non-profit hospital saves through better energy performance is equivalent to generating up to $20 in revenues. Ductless heat pumps provide greater control over temperature by zone, ensuring patient and staff comfort. LED lighting solutions can reduce energy costs and improve ambiance. High-efficiency cooking and refrigeration equipment can be 30–45% more efficiency than conventional models. Administrative offices, examination rooms and reception areas use office equipment and medical equipment that can have a big electrical draw, even when not in use. Consider purchasing ENERGY STAR certified equipment when next updating office equipment, which is 30-75% more efficient than standard equipment. There are also resources to help you identify energy demands of medical equipment; some medical equipment may also be able to be powered down during off-hours. To learn more about ways to manage electricity demand of medical equipment, click here for a National Renewable Energy Lab Report. And to learn more on how to reduce electricity usage, visit the Energy Star website. Ready to upgrade your hospital with high-efficiency equipment? Work with an Efficiency Maine Qualified Partner in order to be eligible for these incentives. Click here to find a Qualified Partner working near you. If you work with a contractor that is not yet a Qualified Partner, urge your contractor to find out more information here. 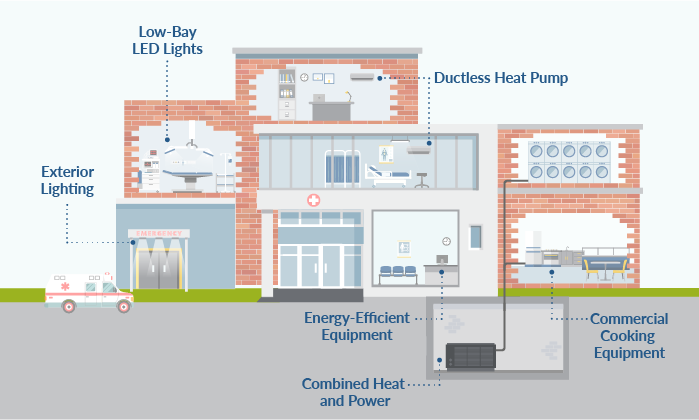 • Advanced Energy Retrofit Guide for Healthcare Facilities. Click here to download the guide. • Healthcare Energy End-use Monitoring. Click here to download the report. • Practice Greenhealth: Organization and web resource covering environmental solutions for the healthcare sector, including energy efficiency. Visit the Practice Greenhealth website.